Zimbabwe’s opposition on Friday rejected what it said were the “fake” results of the landmark election in which President Emmerson Mnangagwa has been declared the winner. 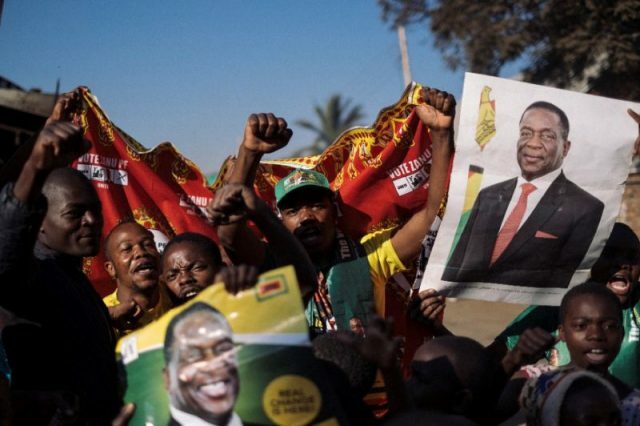 Zimbabwe woke to the news that Mnangagwa, a former ally of Robert Mugabe, had won the historic first polls since the autocrat’s ousting last year with 50.8 percent of the vote, according to the electoral commission. Chamisa dismissed what he called the election’s “unverified fake results”. “ZEC must release proper & verified results endorsed by parties,” he wrote on Twitter, referring to the Zimbabwe Election Commission. Mnangagwa, who was chosen as Mugabe’s successor in the ruling ZANU-PF party after he was removed in a brief military intervention in November, hailed his victory as a “new beginning” for Zimbabwe. “Though we may have been divided at the polls, we are united in our dreams,” he said on Twitter. Analysts EXX Africa said they expected the situation to calm over the next few weeks, with big protests unlikely “due to the heavy-handed security crackdown in the capital and other cities”. “Despite the mixed response on the elections process from international observers, there is little actual evidence to demonstrate the opposition’s claims of mass vote tampering,” they said in a briefing note. “Over the next few weeks, the fall-out over the elections will subside and allow the government to begin to repair its tarnished reputation in order to secure fresh investments and debt relief,” they predicted. Since independence from Britain in 1980, Zimbabwe has known only two presidents — Mugabe, who ruled with an iron fist for 37 years, and his erstwhile right-hand man Mnangagwa, who was appointed after Mugabe was forced out by the military in November last year. The new president had promised a free and fair vote that would turn the page on years of brutal repression under Mugabe, end Zimbabwe’s international isolation and attract foreign investment to revive the shattered economy. But Chamisa has repeatedly alleged that the vote was rigged, charging that the ZEC — synonymous with fraud under Mugabe — had again helped ZANU-PF to steal an election. Turnout was high at over 80 percent in most of the country’s 10 provinces. Before the violence, European Union observers declared they found an “un-level playing field” that stacked various factors in ZANU-PF’s favour, including heavy coverage by state media. “It means our suffering will continue,” Emion Chitsate, a security guard at a shopping centre in the Waterfalls district of Harare, said of the result. Under Mugabe’s rule, elections were often marred by fraud and deadly violence.